The Chicago White Sox picked up a win over Houston 7-4 at Toni Stone Field in St. Paul. Heading into Saturday’s playoff action, only one RBI Senior League team holds an undefeated record. Arizona RBI beat Harrisburg and Chicago on Thursday, followed by Jackie Robinson RBI on Friday to take the #1 seed in the North division. They are set to host Bradenton at 8 a.m. on Saturday. While their performances over the last couples of days secured them a top seeding – and home field advantage – it means nothing once the playoffs begin. This is Arizona’s first appearance in the RBI World Series. The program, started in the Phoenix area in 2010, saw early signs of success but the team couldn’t find their way past Venice in the West Regional Tournaments. After beating Arizona in the regional championship last year, Venice went on to win the entire tournament in Minnesota — earning their program’s first RBI World Series victory. This year, the two teams found themselves matched up once again with a trip to Minnesota and the World Series back on the line. This time, it was Arizona packing their bags for the Midwest. 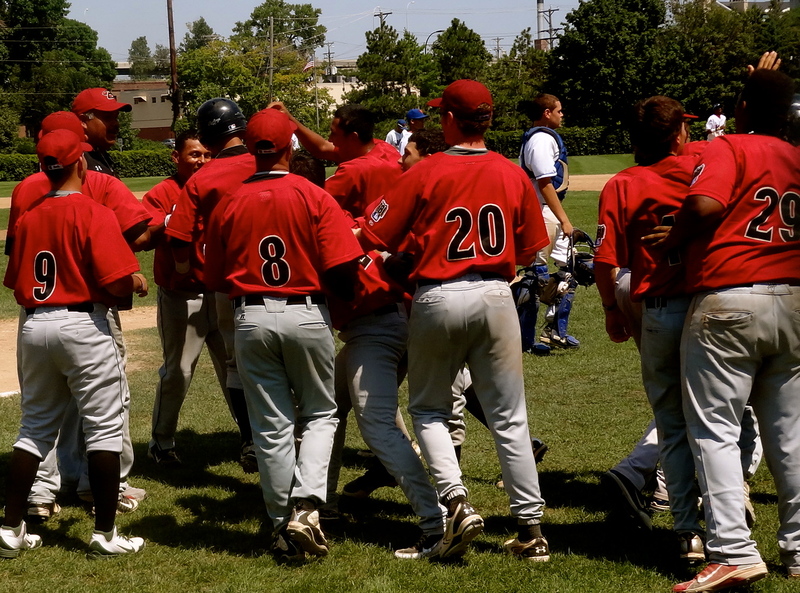 Arizona RBI celebrating their walk-off win over Jackie Robinson RBI to secure a #1 seed for Saturday’s playoffs. Bradenton is also in the midst of the program’s first RBI World Series. After becoming an official RBI baseball program in 2007, the team is very happy about the success they’ve achieved on the field and marks their impact on the community as an added benefit for the team. The Chicago White Sox and Jackie Robinson RBI join Arizona and Bradenton as the other 8 a.m. game on Saturday; the White Sox earned themselves a #1 seed in the South region after picking two wins and a loss. At 10:45 a.m., Harrisburg hosts Houston at the Toni Stone Field in St. Paul and Venezuela plays Detroit at Parade Stadium. The winner of the Arizona/Bradenton game will play the winner of the Venezuela/Detroit game, while the winner of the Chicago/Jackie Robinson match-up will play the winner of the Harrisburg/Houston game; both of the semi-final games will be played at 3:45 p.m. on Saturday with the winners advancing to Sunday’s championship at Target Field.